Why are so many Facebook friends sharing preposterous stories from Natural News? Facebook shares are the only hard data Natural News seems to care about. Have you heard that eating whole lemons prevents cancer? Or that bathing in Himalayan salt rids the body of harmful toxins? That eating hijiki seaweed can delay hair graying? If you have a few Facebook friends, you’ve probably encountered some of these claims. The website Natural News —which seems like a parody but is unfortunately quite serious—published these preposterous stories, and many others just as silly, last week alone. Hokum like this is best ignored, but hundreds of thousands of Americans fail to do so. 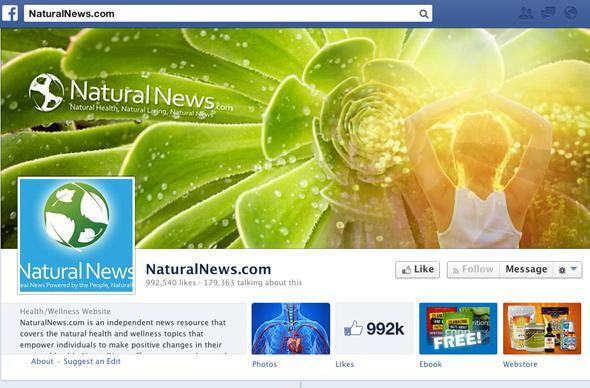 Natural News has achieved astonishing traction on social media, garnering Facebook shares in the high five and low six figures. These numbers should trouble you—Natural News has an uncanny ability to move unsophisticated readers from harmless dietary balderdash to medical quackery to anti-government zealotry. Let’s start by deconstructing the claim that eating whole lemons staves off cancer. The author cites two medical journal articles. She badly mischaracterizes the first, published in the Journal of Agricultural and Food Chemistry in 1999. The study described the isolation of three compounds, known as coumarins, from lemon peel. Coumarins exhibit tumor-suppressing properties in a laboratory dish, but that does not mean that eating lemon peel prevents cancer. Even if the oral ingestion of coumarins were convincingly shown to fight cancer in a laboratory animal, we still wouldn’t know how much lemon peel would be required for a human to experience the same effects or whether you could tolerate the dose. The second study the author cites is an enormous overreach. No one enjoys biostatistics, but bear with me and you’ll be better prepared to identify weak studies in the future. The study, published in the journal Nutrition and Cancer in 2000, purported to show a correlation between consumption of lemon peel and diminished cancer risk. The authors surveyed 242 skin cancer survivors and 228 controls about their citrus consumption habits, but the questionnaire wasn’t externally validated and has some screwy definitions. (Eating citrus peel “often,” for example, is defined as “50-75 percent of the time.” What does that mean?) The authors did not adequately control for race or skin tone, which is an important variable in skin cancer studies. The sample size was much too small. Only 163 of the 470 study participants reported eating citrus peel, and just 28 of them admitted to eating citrus peel often. That’s not enough to prove that eating lemon peel prevents skin cancer. In addition, the statistical correlation is very weak, close to undetectable. Had one more person with cancer reported eating citrus peel, the relationship would likely have disappeared. In fairness, the study authors acknowledged the small sample size and the need for more substantial follow-ups, but everyone knows how these correlational studies are reported in the media. This is why you should look for patterns in scientific literature rather than relying on individual studies. We’ll never be rid of tripe like this—shortcuts to immortality are irresistible—but it’s important not to confuse hopeful superstitions with science. If you loosen your grip on the anchor of evidence-based medicine, you’ll find yourself drifting dangerously toward conspiracy theory. You probably know what’s coming next—vaccines and autism, of course. Natural News loves to prey on vulnerable parents, and it’s jumped all over questionable preliminary studies linking autism with everything from gluten to air pollution to antidepressants to the “Western lifestyle.” But the site’s drumbeat of support for the thoroughly debunked claim that vaccines cause autism is particularly shameful. In case you’ve managed to miss this “controversy” (where have you been and congratulations, by the way), a 1998 paper in the influential medical journal The Lancet claimed that the vaccine for measles, mumps, and rubella caused autism. Sixteen years and many preventable measles outbreaks later, we know for certain that the claim is wrong. Literally hundreds of thousands of children have participated in studies around the world showing no association between vaccines and autism. A 2011 Institute of Medicine review of thousands of different studies reached the same conclusion. The Lancet has withdrawn the original paper and Andrew Wakefield, its author, lost his medical license, in part because he failed to disclose that lawyers preparing to sue vaccine manufacturers helped fund his research. None of this has deterred a small number of evidence-averse anti-vaccine campaigners, who think there is an international, inter-governmental conspiracy including thousands of doctors working for Big Vaccine. Natural News is, of course, bouncing along giddily on the bandwagon. In September, for example, the site published a story claiming that the government has “once again conceded” that the MMR vaccine causes autism. Here’s what actually happened. In the 1980s, the federal government set up a fund for people who may have been harmed by vaccines. Although such injuries are extremely rare, vaccines are administered so broadly that tort claims could clog up the courts and deter drug manufacturers and doctors from providing vaccines. The fund does not compensate parents who believe their children developed autism as a direct result of receiving a vaccination—the fund’s administrators rejected that link in a series of test cases. However, some researchers believe that certain vaccines may in rare cases prompt an adverse reaction and cause encephalopathy, at a rate of about one case in 310,000 vaccine recipients. As a result, the fund pays children who were diagnosed with encephalopathy shortly after receiving a vaccine, whether or not they can prove causation. In some cases, children with encephalopathy are later diagnosed with autism. However, just as researchers have been unable to prove a causal link between vaccines and autism, they have been unable to produce convincing evidence that encephalopathy causes autism. Evidence be damned, though. When the vaccine injury fund compensates an encephalopathy victim—whether or not autism is involved—sites like Natural News describe it as a government admission that vaccines cause autism. It’s nothing of the sort, but this unique brand of yellow journalism has earned the site 75,000 Facebook shares and counting. That’s the only hard data Natural News cares about.